The Lauryn bedding collection by Croscill screams natural beauty. Deep red and neutral tan combine to create a beautiful look for your room. The classic Jacobean jacquard design is timeless. This ensemble features twisted cord detailing and a pleated bedskirt to add extra dimension to your room. The European sham and throw pillows feature details like a graceful brush fringe and a updated chevron print. Use a combination of the circle valance with button detailing and drapery panels done in a coordinating chevron print to create a customized look. The colors and prints of this collection will withstand the ever-changing trends of today. Croscill has been a manufacturer of high quality bedding at affordable prices for more than 50 years! 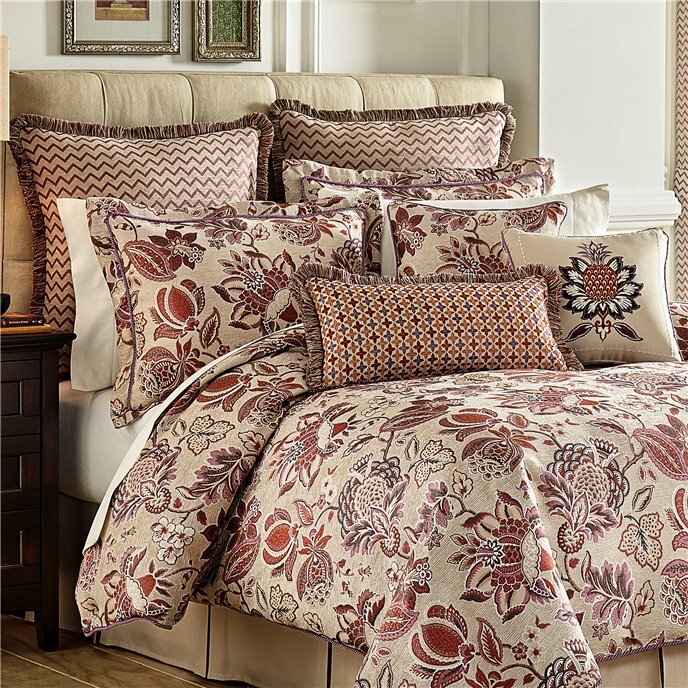 The Lauryn Bedding Collection uses a mix of rich and neutral colors to create an eye-catching set. The rich colors are shown in the Jacobean jacquard design, while the neutral colors come through in the chenille ground. The comforter and flanged pillow shams showcase the stunning colors in this beautiful Jacobean jacquard pattern, finished with a sophisticated twist cord. While the Bedskirt has a neutral textured fabric presented in a pleated design for added dimension. One (1) Queen Comforter, two (2) Standard Shams, one (1) Bedskirt 15in drop, Comforter measures 92x96, polyester fabric and poly fiber fill, dry clean recommended, imported. Manufactured by Croscill. The Lauryn Bedding Collection uses a mix of rich and neutral colors to create an eye-catching set. The rich colors are shown in the Jacobean jacquard design, while the neutral colors come through in the chenille ground. The comforter and flanged pillow shams showcase the stunning colors in this beautiful Jacobean jacquard pattern, finished with a sophisticated twist cord. While the Bedskirt has a neutral textured fabric presented in a pleated design for added dimension. One (1) Cal King Comforter, two (2) King Shams, one (1) Bedskirt 15in drop, Comforter measures 110x96, polyester fabric and poly fiber fill, dry clean recommended, imported. Manufactured by Croscill. The Lauryn Bedding Collection uses a mix of rich and neutral colors to create an eye-catching set. The rich colors are shown in the Jacobean jacquard design, while the neutral colors come through in the chenille ground. The comforter and flanged pillow shams showcase the stunning colors in this beautiful Jacobean jacquard pattern, finished with a sophisticated twist cord. While the Bedskirt has a neutral textured fabric presented in a pleated design for added dimension. One (1) King Comforter, two (2) King Shams, one (1) Bedskirt 15in drop, Comforter measures 110x96, polyester fabric and poly fiber fill, dry clean recommended, imported. Manufactured by Croscill. The Lauryn European Sham features a delightful chevron jacquard on a neutral chenille ground. This sham reverses to a solid textured fabric and is finished with a graceful brush fringe. One (1) European Sham, Measures 26x26, polyester fabric, dry clean recommended, imported. Manufactured by Croscill. The Lauryn 18” x 18” Square Pillow features a striking multi-colored Jacobean jacquard on a neutral chenille ground. This pillow reverses to a solid textured fabric and is trimmed with a delicate twist cord. One (1) Square Pillow, Measures 18x18, polyester fabric and poly fiber fill, spot clean recommended, imported. Manufactured by Croscill. The Lauryn 24” x 12” Boudoir Pillow is the perfect complement to your décor with its eye-catching embroidered design on a solid textured fabric. This pillow reverses to the solid textured fabric and is trimmed nicely with a graceful brush fringe. One (1) Boudoir Pillow, Measures 24X12, polyester fabric and poly fiber fill, spot clean recommended, imported. Manufactured by Croscill. The Lauryn 16” x 16” Fashion Pillow features a stunning embroidered pineapple design on a solid textured fabric. This pillow reverses to the solid textured fabric and is trimmed with a delicate twist cord. One (1) Fashion Pillow, Measures 16x16, polyester fabric and poly fiber fill, spot clean recommended, imported. Manufactured by Croscill. The Lauryn Circle Valance features an eye catching multi-colored Jacobean jacquard against a neutral chenille ground finished with a lovely covered button. PLEASE NOTE: A total of three (3) valances were used to achieve the look in the photo. Valances and curtain panel pair each sold separately. One (1) Valance, Measures 42x24, polyester fabric, dry clean recommended, imported. Manufactured by Croscill. The Lauryn Curtain Panel Pair features a delightful chevron jacquard on a neutral chenille ground with matching tiebacks. Each panel is lined with a solid white polyester lining and include encased weights in the bottom hem. PLEASE NOTE: A total of three (3) valances were used to achieve the look in the photo. Valances and curtain panel pair each sold separately. Two (2) Window Panels, two (2) Tiebacks, Measures 82Wx84L, polyester fabric, dry clean recommended, imported. (2nd picture shown with valance sold separately.) Manufactured by Croscill. The Lauryn Curtain Panel Pair features a delightful chevron jacquard on a neutral chenille ground with matching tiebacks. Each panel is lined with a solid white polyester lining and include encased weights in the bottom hem. PLEASE NOTE: A total of three (3) valances were used to achieve the look in the photo. Valances and curtain panel pair each sold separately. Two (2) Window Panels, two (2) Tiebacks, Measures 82Wx95L, polyester fabric, dry clean recommended, imported. (2nd picture shown with valance sold separately.) Manufactured by Croscill.